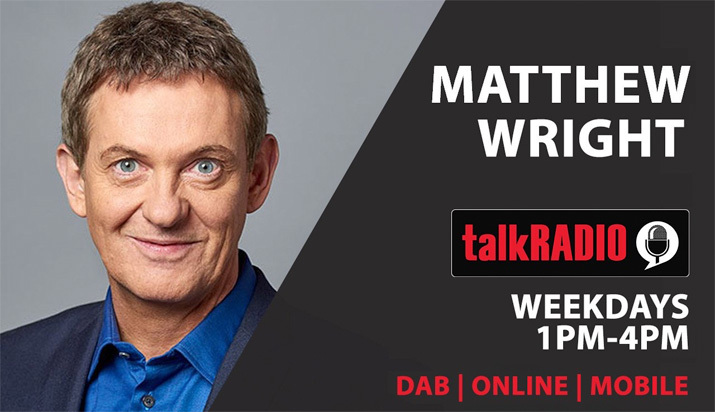 Matthew presents The Matthew Wright Show” on talkRadio every week day from 1pm till 4pm. From 10th September 2018. Matthew is joined every day by Fleet Street legend Kevin O’Sullivan. Matthew and Kevin will bring you the latest news, gossip and the usual array of celebrity guests and experts. Matthew Wright is joining Wireless station talkRADIO from next week to present the 1-4pm afternoon show, replacing Jamie East. Wright recently finished his daily Channel 5 TV show after 18 years – a slot taken over by Jeremy Vinefrom today. Matthew is a former Sun and Mirror journalist, and alongside his TV presenting work has done cover presenting on Radio 2 – including for Steve Wright and Jeremy Vine. He’ll be joined on talkRADIO by Kevin O’Sullivan, who currently does the 1-4pm slot on London station LoveSport Radio. talkRADIO programme director Dennie Morris added: “We’re absolutely delighted to welcome Matthew Wright to talkRADIO. I’ve worked with Matthew previously and know from first hand experience the passion and commitment he brings to everything he works on. I know our audiences are going to love his new show.